We are going to let you in on a little secret. September and October are two of the BEST months to visit Carolina Beach. Here are some of the top reasons we love the Fall at the beach and we think that you will agree. The weather is still warm enough to relax on the beach and take a swim in the ocean. Since the “tourist season” has ended everything is much less crowded. It is easier to get into your favorite restaurant! There is more to do. 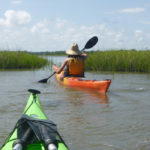 Activities like kayaking, hiking, and biking are more pleasant without the super high temps and humidity of July and August. The best outdoor events happen this time of year. Some of the most popular festivals coming up include the Carolina Beach Dragon Boat Regatta, Pleasure Island Seafood, Blues and Jazz Festival, Grooves in the Grove and various Farmers/Artisan markets around town. More fun for your furry friend! 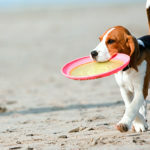 Rules for walking dogs on the beach are more relaxed as Fall approaches. We hope that you join us this September at the Beacon House Inn Bed & Breakfast to see for yourself all that Carolina Beach and Wilmington have to offer this Fall! 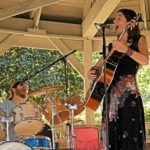 This entry was posted in Carolina Beach, Fall Events, Family Friendly, General, Jazz and Blues Festival, Kayaking, Music Events, outdoors, Travel Tips by admin. Bookmark the permalink.